Urban Composting: how to convince your building that it’s cool. It’s January 10th and I am pleased to announce that I have already fulfilled a resolution! Never mind that it was a resolution made back in 2010. This weekend we inaugurated a volunteer-run, community-wide composting program in my apartment building. It took about two seconds to dump the first batch of kitchen scraps into it and about two years to get to that point. Until yesterday, my family had been composting with worms in our apartment for several years and I can’t say enough good things about worm bins! In my perfect world, every apartment kitchen would come with a built-in worm cabinet, just like they used to come with drop-down ironing boards. However, as a family of four that cranks out three meals a day, the number of food scraps we produced was overwhelming our bin. We would need three or four worm bins to manage our food scraps and – unless we built our coffee table out of worm bins (which isn’t such a bad idea, actually) – there would be nowhere to put them in our “cozy” abode. 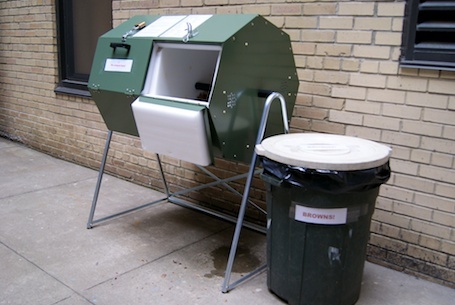 Since a number of my neighbors had also expressed interest in composting (one was already going to the trouble of freezing her scraps and hauling them down to the Union Square Greenmarket, one of the cities compost collection sites), it seemed worth exploring a communal composting solution for our building. Composting in New York City seems to be where recycling was in the early 1980’s: something that is slowly gaining momentum, but is still viewed as outside the mainstream. I imagine there were the same arguments against recycling then, as there are against composting now: that it takes too much time to separate your garbage, that somehow the building’s facilities staff will be unduly burdened, and is it really worth it anyway? And, of course, there is an extra barrier for some people: “Ew! Worms!” or “won’t it smell gross?”. While I’m an advocate of recycling and feel that everyone should take responsibility for the waste they produce, recycling by necessity relies on an infrastructure to actually transform your plastic bottle or newspaper into something new and useful. 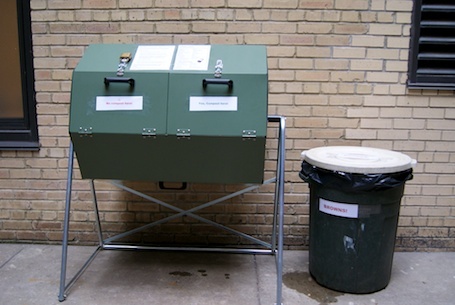 Composting, by contrast, is a closed system. You get a bin, add your scraps, stir it around, and a few months later you have a beautiful, rich compost that can be added to your plants or tree beds (you could probably even sell it on Etsy). There is literally no downside and a huge upside in the palpable reduction of your own garbage (26% of the material that ends up in landfills is food scraps and yard waste that could be composted instead). With the vast number of different types of compost bins on the market these days, there is a fit for just about any lifestyle. For people outside urban areas with easy access to outdoor space, a compost bin should be a no-brainer. And if you live in a city and don’t produce more than 3 lbs of food scraps per week, a worm bin would suit you just fine. But for those of us in the middle: living in a city with a family and producing more waste than one worm bin can handle, the best thing to do is to band together with your neighbors. Start by garnering the support of your neighbors. This is a volunteer endeavor and doesn’t require the buy-in of the entire building. You just need between 2-4 families to form a pilot project. In fact, it is better to start small and add people as the project becomes a success. Try to get the building management on your side. After all, even if the program is completely resident run, it will have an impact on the building’s waste management workflow and it is helpful to have a good relationship with those who maintain the public spaces. If you live in a rental building with high turnover, this will be a harder sell as it will really fall to building maintenance staff to keep it going. But who knows? They may just be waiting for this opportunity! Prepare to be rebuffed initially. Perhaps outright or perhaps by evasion. There will never be time to address it in the meeting. Or it will be “too much for the building to take on right now”. Don’t be discouraged – it took over a year and a half for my building to come around. Gentle prodding and reminders about how many buildings in the city are already composting successfully will help. Without being totally annoying, talk incessantly about how many fewer garbage bags will sit on the curb once we are composting. Appeal to the “green” side of the folks in control. No one wants to look like the Once-ler. If you live in NYC, call in the experts. For only $25, a member of the LESEC will visit your building, give a composting demonstration and talk to building managers and residents about the specifics of composting in the city, which is what we did one Sunday in early December. There is nothing like hearing it from an outside authority and I can’t say enough about how important this was for us. We spent two hours on a Sunday afternoon talking about “greens” and “browns” with Natalie from LESEC and at the end of it, even the initial critics were enthusiastic about the project. They even helped us select the most appropriate bin for our building. Once you get the green light, you are almost there. The next step is selecting and ordering the bin. After much reflection, we decided to go with the Jora JK270 Compost Tumbler, which we ordered from EarthEasy. It is on the more expensive end of the spectrum and you can certainly get a good bin for much less, but we chose it because it had enough capacity for our entire building, and it’s dual chamber set allows one to keep adding to the other side of the bin once the first side is full and needs to cure. The fact that it sits high off the ground making it extra pest proof and easy to spin sealed the deal. Once it arrived, the next step was to put it together. Coming from Sweden, the directions were written in high IKEA and totally unfathomable. Luckily, EarthEasy includes helpful assembly videos on their site. We watched as a strapping young lad took about 11 minutes to assemble the bin all by himself. If I showed you a video of my husband and me assembling the JoraJK270, it would have to be a feature length-film, as it took us nearly three hours to put the damn thing together and almost ended our marriage. The film would be considered a “dramedy”, and I do admit that I questioned my commitment to the environment that evening. But that is behind us now and we have a rockin’ bin to show for it. The next challenge was collecting enough “browns” – the carbon based plant material that forms one part of the composting quadrivium: Browns, Greens, Air and Water. In a healthy outdoor bin, you should have two parts brown material to one part green material. Greens are what you have in your kitchen. Browns are what you have in your yard. Except when it’s December in NYC and you don’t exactly have a yard. Thus, began a rather comical search for lawn waste that ended in my surreptitious foraging for mulch in Central Park. It was exciting. I mean, I could have been arrested. First the “browns” were added. I covered them with some more browns, gave the bin a spin, and walked away. It should be that easy in every building. So far, we have five committed participants and another 5 or 6 residents who want to join in the fun. As half of our building consists of graduate students, we will orient them to the bin next fall. Who knows what lies ahead: fruit flies? Strange smells? Reduced garbage? Hopefully gorgeous compost that is so badly needed in our garden and for our poor street trees. Wish us luck and we will keep you posted. This entry was posted on January 10, 2012, 10:37 pm and is filed under garden, Green. You can follow any responses to this entry through RSS 2.0. You can leave a response, or trackback from your own site. I am as impressed with your time management skills as I am with your committment to the environment. I don’t know where you find the time to accopmplish all that you do. Well. Once again-Topcik-you’re making the rest of us look bad. You’ve accomplished more in the first 9 days of 2012 than many of us did in all of 2011. Rock on with your bad self. Funny you should get freshly pressed today since I just handed my son a bowl of scraps this morning and said, “We should compost this. Take it out to the corner of the yard.” We don’t have a slick composter like you, but we do have, as of this morning, a dedicated corner. Love that you took pictures of your trash for your blog! Love the comments; great post. Once the composting process starts, it is amazing how quickly it occurs. I think it was smart to start it in winter. It can get a bit smelly at first, as the anaerobic bacteria seem to settle in at the beginning. The cold weather seems to either deter this, or else one is not outside enough to notice. Once it is up and running, there is very little odor. Thanks! I’m a little worried that the by starting in the winter the compost won’t get to the temperature it needs to to actually break down, but we’ll see. It has been very mild here. the cold temperatures of winter will have no impact if the conditions inside the bin are right. you have the right brown-to-green ratios, the next thing to keep an eye on is that there is sufficient moisture. decomposing matter needs enough water to break leaves, straw, lettuce and other food scraps down. but not too much. you can tell that you will have the right combo, if it is producing heat. yes, enough heat to feel warm throughout the winter cold. congrats on such a feat! Thanks for the insight, I’m going to check more into this. Its super interesting. I am so impressed with your success! You have inspired me to try and facilitate a move toward community composting in my building. Thanks for your post and wish me luck!! That composter looks awesome! My husband and I have a worm bin as well that has turned into a worm condo mainly due to entertaining and the amount of coffee consumed in our home. I too wish apartments came equipped with compost bins… I guess we can continue to dream. I love worms! And love your terrariums, too! I work at a camp in the Ecology Department, and we started composting because of my boss’s idea of Urban Composting and “Closet Composting” we started composting in a rubbermaid bin, and I upgraded to a GIANT Deep Freezer and we composted All the fruits from the summer! That is genius and a great way to drive the point home to kids! Thanks for sharing. You definitely should try a worm bin. There is a ton of info out there on the internet to get started. And of course, there is the seminal book, “Worms Eat My Garbage” by Mary Apelhof. It’s still in print and helped me a lot when I first got started. Good luck! After 3 years of backyard composting in Minnesota, I was thrilled to move to the Bay Area and discover curbside composting. They take everything – meat and pizza boxes included. Between that and the recycling bin, we have hardly any regular garbage. Good luck with your community compost. I’m originally from Minnesota! New York can only aspire to be as awesome as San Fransisco when it comes to environmental commitment on the civic level. Glad to know it is working well! Great Stuff! I am more involved in a rural environment and am in a quandary at times of what relates and what I may suggest to my city cousins. You just answered several questions that gives new direction. Mahalo. Very cool. Living in one of the few high rise buildings in Tulsa, I can attest to the need for this. Would make our basement garbage collection smell a lot better too! Go for it! And good luck! How cool that you got this together! Kudos! Me, I want to build planters maybe 3×4 feet by 18″ deep and then compost the refuse every year and cycle that back into the soil. Go for it – a great idea! Good post and good idea. I run a community garden in Central London (with big compost bins), but we try to encourage people to have their own at home. The only problem I see with communal compost bins is that there is always one idiot who will misuse it (either through idiocy or ignorance), putting in ordinary trash, inappropriate food waste or even chemical waste, potentially spoiling the whole batch of compost (provided the mistake is spotted in time). Is that a worry for you? It is a worry for us. One of the reasons I think this will work is because I live in a small building (it’s academic housing actually, so I live and work with all the same people) and we are requiring everyone who participates to go through an orientation. The bin is in an out-of-the-way location that is separate from where we put our garbage or recycling, so think that will help. And I’ve posted a bunch of signs about what you can and can’t compost, but I’m still hoping nothing goes wrong. I basically check it every day – something of an obsession. In a community garden setting, how to you monitor what people put in? In our garden we have limited opening hours, so it’s easy to monitor what goes in the compost bin and set straight those who put bread or cooked food in, although there is always the odd vandal who throws trash into the compost from outside the fence, but that is easy to remove. Actually, I have always kind of laughed at the whole hulabalou with sorting ones garbage and what not, as we were doing that as far back as I can remember in the 60’s I believe. Well part of that is because we didn’t have garbage pick up, so we had to hall all of our garbage to the dump (that is a nasty thing to do, as it is dirty, and dusty, and smelly! Everyone should have to do that, and we would have less fill). Back then you could not recycle anything as that was unheard of, so there was the compost pile, the cans and bottles, and then the burnable stuff… Oh wait, I forgot the stuff that could be fed to the animals. We raised chickens, turkeys, and a pig that were all food. Then there were the rabbits that I harvest the fur from, the dog that my father complained did not earn its keep cause it had no purpose but cuteness, the cat who kept the mice and most of the rats down, the guinea hens that cleaned up the bugs below the bug zapper… Hummmm, Did I miss any critters? I don’t think so, or at least not any tame animals there are always wild ones… Lets see the family of lizards that live on my porch, the frogs that I sometimes find crawling up my bedroom wall at night, and of course the snakes are everywhere around my house. Then we have the coyotes, skunks, thousands of geese and ducks, wild swans, egrets, blue herons, seagulls, and I believe hundreds of other species. I really can not imagine living in a city such as NYC. I did however attend college is San Francisco, but returned somewhat to my roots in the country. Actually I live five miles down the road from my old home, and that is considered out her to be a neighbor. Congrats on your compost bin, and by the way, we just through hay over it for what you call brown stuff. A layer of hay, a layer of food stuff, a layer of hay, and then we water it, and I believe we through manure in there too, but we had tons of that too. I am sure if you have friends from the suburbs they would be glad to let you have their leaves, and browns also. Sorry this is so long… How does that happen???? Always good to share sustainable ideas! Well done for getting this going. I’ve been composting with worms for a few years now and am really happy with the result. It’s really reduced the amount of rubbish we used to throw out on a weekly basis. I admire this! And I plan on startinga similar project in my new complex. thanks for a great idea. Congratulations on achieving your 2010 goal so early in 2011! But seriously, it is fantastic that you were able to get a public compost bin for your building. I am new to composting but I believe that it is a very important thing to do. It is amazing that our leftovers can be turned into something so healthy and useful. Kudos to you for persevering! Your observations about piloting and starting small are so apt and you no doubt will have a great success on your hands over time. brilliant. I love recycling and sustainable living.The city of Sydney promotes such things. A worm farm sounds like a really fabulous idea. I have room on my balcony so I’ll get right on it. Thanks for the prompt. Actually, comment 23 is by someone who runs a community garden in central London and knows about compost. The site is http://soasfoodcoop.wordpress.com/. Not sure if that is anywhere near you, but if you have a community garden nearby, you could contact them to see if they would take your compost. You can also use it in your houseplants. If you have an indoor worm bin, you won’t produce so much that is overwhelming. Good luck! Kudos to you and your efforts! You’re right – it doesn’t matter that this was originally a resolution for 2010. The point is that you’ve done it, and found success. It’s so important for people like you to start these initiatives. It will only grow in popularity as time goes on, and you’re improving the world we (and our children) live in and making it more beautiful. You would make Ms. Rumphius proud! I was just having this very conversation with a coworker over lunch yesterday! That’s awesome! Great job getting this in your building and management on board. I just started a worm compost bin yesterday. Literally. Had to order the worms online, but I am super excited to see how it turns out! Yay! Worms are the best! Good luck. A tip. Freeze your citrus and banana peels before you add them to the worm bin to avoid fruit flies. I love your post! I have been renting for years now and I boyfriend and I compost, but we feel bad about digging holes in peoples yards for a compost, great idea and thanks for sharing. I am impressed with your commiment. Our world needs more people like you! Great idea. Our condo is 40 years old and if it had been composting this entier time, imagine the garden we would have. We’ve been toying with the idea of composting in our condo and then taking up to our Schoolhouse cottage on weekends. Such a fantastic idea! I am hoping to move to a new complex come March that is supposedly healthy living and enviornment focused. If they don’t already have a composting bin I’m sure it would be such an easy thing to get started! I can’t wait to get one of these going! very nice post and you got the great idea. This is such a great guide I had to share it on my Frugal Goddess page on Facebook. In addition to being pure frugality at its best, urban composting is also a much needed practice to green our cities. I am so glad I clicked. Thanks! Great post! We LOVE composting! Holy crap, this is extremely in depth! I’m going to give my house hugs now, I’ll ask the neighbours to do the same. Congratulations on seeing all of your hard work pay off. That is so awesome that you were able to get that accomplished. When I first moved to New York City, I had never even heard of urban composting, but I was lucky enough to move into a building that had just instituted a program for doing just that. At first, I was a bit reluctant to participate (sheer laziness in truth), but after watching how plants thrived from using the compost and longing for more greenery in my life, I became an avid participant. I am so happy to hear about your accomplishments, and very much enjoyed learning about the journey that you took. I hope that it is a wild success, and I look forward to reading more about it in the future. Keep up the great work! very good. must try to get my neighbours in on this too. well done. As an urbanite, I really wonder about the impact of composting and roaches? It’s sort of like the “eww, worms”, thing, but kinda worse. At least the worms are contained, and if they do manage to get out, they don’t congregate behind your refrigerator and plot the destruction of the world the way cockroaches do. Besides, you can catch and kill a worm much easier than you can catch or kill a roach. Also, I’m curious to know if the outdoor compost attracts rats? Getting it off the ground probably helps with rats, but are they drawn to the smell, and then congregate around the bin, or try to chew into it? I would love to compost, and know of several organizations in my neighborhood that would be behind the idea 100%, but truth be told, I’m terrified of getting an infestation. It’s funny, in all the years I had a worm bin, not one worm tried to make an escape – I guess they want to stay where the food is. My daughter thinks they are our pets (it’s not that depressing, we also have a cat). As for an outdoor compost, I was worried about rodents, too. And frankly, the bin is so new it has yet to be tested. But the fine folk at the Lower East Side Ecology Center assure me that it won’t be a problem. The bin is made of galvanized steel and is high off the ground, so it really would be hard to break into. It sits in an outdoor courtyard that my building uses to store bags of garbage before they go out to the street and the bags of garbage are much less secure than the bin. But, we’ll see what arises with this experiment! LOVE that your article’s been Freshly Pressed! 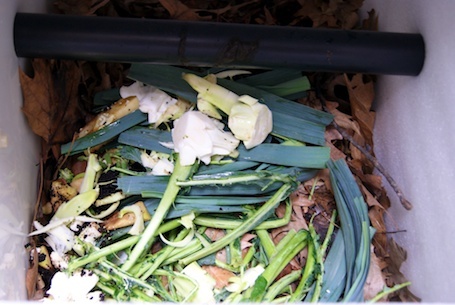 Composting is an important part of our world, yet not many people share the same idea. Looking forward to reading more of your work! Thanks for the fantastic post!!! I’ve always lived in rural or suburban areas with plenty of back yard space for a compost pile or bin. Growing up composting is the best introduction. It’s so easy to learn and becomes just as automatic as brushing your teeth. It’s not a matter of whether or not, it’s just where! I’ve either composted or had a worm bin at every house i lived in, through college and living abroad as well. Congratulations on making a fantastic new years resolution come true. Yes! That is how it should be – like brushing your teeth. Great metaphor. Do grass clippings count as browns? or does it have to be other leafy matter? I would love if we could keep in touch with each other and follow each other in our journeys. I am chronicling the year by taking at least one photo a day! Many of my neighbours – in my 95 unit complex – still have to figure out how to put their garbage in the bin. Since they haven’t mastered that I’m not sure how I’d go trying to convince them to get a worm farm. I applaud your efforts. I keep meaning to get a compost bin and never get around to it. Compost bins are really good. I think it’s great if anyone has one. I hope one day composting will be the norm; it just takes time for it to be a popular habit. You have my respect and admiration for taking an active role in improving your little corner of the world! Well done. My friend, who is also my gardener would love this post. She is trying to persuade me to do it. Me and composting? Well, I gave up after the rats started visiting! What worms do you use? – but I don’t know if they are fast enough . . .
my guess would be – one these people. I saw leek tops in the bin and it reminded me of making my stock out of veggie scraps and chicken bones. 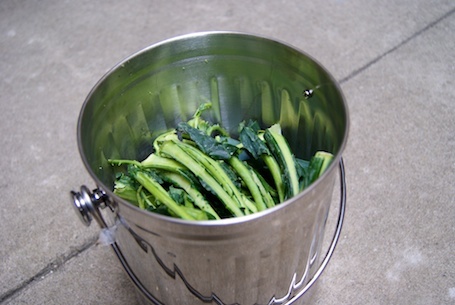 Can you compost cooked veggie matter (without the bones)? Yes, you can put cooked veggies in the bin, provided they aren’t too oily. We put the vegetables we use for stock in – so far, so good. great post. I’ve been wanting to do more composting this year. In our case, the building paid for the bin. I wasn’t sure that was going to happen, though, and if it hadn’t, those of us who wanted to do it would have pitched in to buy it. You can get a good bin for much less than what we paid – around $100 or so. Good luck with your endeavor – you never know how many of your neighbors are thinking about the same composting, too! I lived in Jackson Heights (Queens) about 20 years ago. I did some gardening around our apartment building. This was more gorilla gardening that the garden club. As I worked my way around the areas of open dirt, cleaning up the trash and adding some plants, I began to work on turning an any organic matter that I could find to lighten the soil for moisture. I did not have formal compost areas, but hid a few piles of leaves behind bushes. A few years ago, I return to visit a friend. I walked by the building, which is now a condo, and identified the trees that I had planted from seedlings. Keep up the progress. Oh, yes, I was recycling in the ’80’s too. What an inspiring story. I’m just starting out on my own as a renter of a very tiny, rather transient place, but one day I hope to work my way up to having the perseverance and dedication to start a community composting program! As someone who has always had a plot of land, room to compost and flower and vege gardens to use the compost in, I found your post fascinating and really intersting. Congrats on managing it in a city like New York. I wish you every success. You know how to make the city a better place ! I enjoyed reading your lines. Take a look at my page ! …Any tips on how to convince your college’s administration that it’s cool? Or your roommate? Haha it’s not easy! Some of this advice definitely applies, though, so thank you for sharing it! Depending on the school, some college campuses might be eager to “go green”. My building is actually a residential building for a small graduate program connected to a small college. One of the arguments we used is that it would be good PR for the school. Of course, we have very few units and no dining hall, so the scale only sort of applies to a large dorm. But I would encourage you to find out the right person to contact and see if it’s feasible to try a small pilot program. Or see if you can find like-minded students to form a group to show the administration that it’s important to the student body. This matters more than you might think! Good luck – love your blog! I wonder if and when the modern city is on its way out. Cities are such oil intensive creatures and composting and other sustainable methods of living don’t seem to be much part of the infrastructure plan at the moment. It’s no surprise why it’s so expensive to live somewhere like NYC. Glad to see someone trying to make a difference. It takes all cogs working to make the wheel spin! Well done! I live in a rural area and am constantly stunned with how few people compost. It is considered outside the mainstream here too, believe me, and we’re on the edge of the Adirondack Park in Northern NY! So many people here have kitchen gardens, but they run out to buy plant food instead of simply composting the waste they generate. Sometimes it almost seems like they’re trying to find the most expensive, wasteful ways to do things. I think there is just this perceived barrier of entry. It’s almost like composting needs a public service announcement during the SuperBowl to get people onboard. Awesome post! Thanks for the info. Go for it! And let me know how it goes. The more the merrier! in my town (Würzburg) we have extra garbage cans for the kitchen garbage. the township collects it like the do with the normal garbage and bring it an puplic compost-place. After composting you can buy cheap soil for your garden. Its so importend to compost, because otherwise it gets burned, the ashes gets contaminated with dioxin and digged in the ground and so, worthwhile soil gets wasted. Germany always seems to be ahead of the curve in things green. My first experience with composting was actually when I was a high school exchange student near Tuebingen and the family I lived with composted in their garden. There were so many things about my host family’s lifestyle that I have tried to replicate in my home here. Love the “Story of Stuff”, too – thanks for posting. Wow, all I can say is well done for sticking to your goal and getting this up and running! I absolutely think composting should be the norm for every residence, and it is coming along in that direction. I have a compost heap in my garden, but then I live in a rural area so it’s much much easier for me. I was reading a book by Thich Nath Hanh about Buddhism and he talks about compost a lot. It’s almost his go to example for the concept of looking at the great things we can get from the garbage. I’m really looking forward to composting everything when I leave this apartment (my landlord is anti-compost). Wow you are such an inspiration! I wish I had those time management skills! 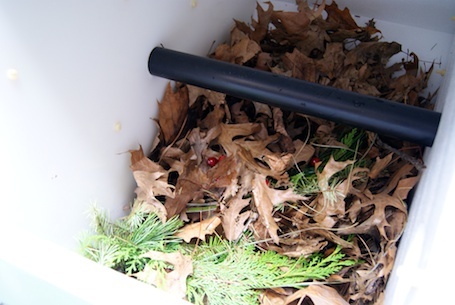 Great post on composting! You might also like my blog on natural health/wellness! http://manfonhealth.wordpress.com/ Cheers! I am so glad I found this site. By coincidence, a few days earlier I started a communal composting system at my place. I live in a complex with around 40 residents in Korea-town in Los Angeles. When I moved here a year ago I immediately planted a vegetable garden and started maintaining the many neglected fruit trees in the yard. All last summer I gave fresh-picked tomatoes and squash to the managers and thus endeared myself to them. I recently got a free compost bin from Freecycle and was frustrated at how slowly it’s filling up. A chef works in a kitchen on the premises to feed many of the residents. Last week I asked the manager to save food scraps from the kitchen for my compost bin. They now give me many gallons of kitchen scraps every day. I trim and prune plants and trees in the yard to generate “brown” stuff to mix with the greens from the kitchen. When the bin fills I will dig a large hole in the yard, fill it with compost, then plant squash plants on top. Then I’ll start another compost heap and so on. By early summer we will have great piles of compost-enriched garden beds all over the yard with tons of food growing. How to Make compos without bad smell ? Place it away from doors or windows. Mix in material like dried leaves and twigs to create air permeability that eliminates slimy anaerobic conditions. Make sure you don’t add anything with weed seeds. Thanks for the tip! I’ll spread the word! Yes you can purchase compost on Etsy! I think it would be a fun project to design cute packaging. Great idea thanks for the inspiration! Very cool! I would love to have one of these composters. I attempted to make one several years ago and it was a bit of a disaster. Composting can be done in simply a pile on the ground or a hole in the ground. A compost bin can be easily made by pounding four stakes in the ground and wrapping them with chicken wire. Thanks for your words of support! Perhaps you can be the trailblazer of recycling in Bulgaria – it has to start somewhere. Good luck! This is great so see! Congrats to all involved! There are some amazing people doing amazing things all over the world. Some are individuals changing their own habits a little (for whatever reasons), through to government supported and huge organisations and networks. Whole towns are reducing waste (not just recycling). Whole towns are finding ways to create new (or at least not waste) resources. I’ve started fermenting kitchen scraps. Sounds all green and world conscious? Not really anymore; just the easiest and most sensible thing! NOTE: Getting easier and more sensible for the untamed every day, keep a watch out and jump in when it looks like it would fit into your lifestyle and abilities. I have got an interest in reducing waste, but I mainly picked this because I am lazy and my family are lazier. I can throw everything in a compostable bag, wave a bit of magic micro-organism powder around, leave the bag laying around for a couple of weeks (not smelling as it’s ferment not rot) and hey presto! I’ve bred countless billions of a few ‘good guys’ that can make just about everything in my garden better. Bonus! There’s nothing but a bit of cling wrap in my bin this week as everything: vegies, meat, fish, paper – if doing it this way, cheese, oily stuff – everything but liquid is ‘in the bag’. I’ll stick it in the compost, feed it to the worms or bury it in my garden so it can do the rotting part and turn to soil while it speeds everything else along. Those that have the money or are not inclined toward world saving philosophies can buy all the commercial products to assist; those that can, can make their own; the non-gardeners can contribute to gardens and we can all come together as neighbours and communities to make it all happen. Who would have believed that this generation could turn cities into resources? So heading there! ; Go for it! I hear the generations before saying, “we’ve been doing this since the ’80s, the ’60s, the ’30s, Mum and Dad did it, our ancestors did it”. Be proud! Your continual efforts are now being rewarded by a surge. These people maybe have lost the stories of generations and will need to learn again to become custodians of the world (and many are willing to do just that). Take care to listen well; form your own sound opinions and experiences. Be an example; share knowledge not misinformation. Strive; you will succeed. Learning to do less harm is one thing; more people are starting to do more good! Like a wave picking up each tiny water droplet as it moves forward. PS If people don’t quite catch this wave, there will be another along any time now. Once again, congratulations for organising this, and for sharing it.